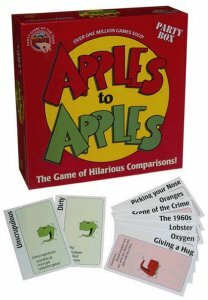 Apples to Apples is the wild, award-winning card and party game that provides instant fun for four to ten players! Each round is filled with surprising and outrageous comparisons from a wide range of people, places, things and events. Fast moving and refreshing, Apples to Apples is perfect for any get-together with family and friends. This simple game is designed to be played by 4 to 10 people, making it a good choice for parties or family groups. It uses two sets of cards: red apples and green apples. The red apple cards name a person, place, thing, or event, and the green apple cards feature a characteristic (from adorable to zany). The judge (who rotates on each turn) reads a green card, and all the players have to slap down their choice of red apple cards for that characteristic. Some juicy choices and comparisons are bound to emerge – along with some fruitful lessons in famous people and events. Out of the Box Publishing – More games from the publisher of Apples To Apples, including Blink, Squint, Qwitch, Snorta, and many more.